There is no denying functioning brakes are an integral and essential part of maintaining a safe vehicle. Understanding how and when to take care of your brakes prevents accidents, and keeps drivers and passengers safe. The beginnings of brakes go back to a discovery by seventeenth-century French mathematician and philosopher, Blaise Pascal. He experimented in thermodynamics by changing the pressure, at one point in a confined fluid, and recognizing this pressure message is sent to the rest of the liquid without reducing the amount. Brake lines in a vehicle are filled with confined fluid so that the act of applying pressure to the brake pedal translates into pressure through a piston in the master cylinder, and then transmits to each of the four brakes. The master cylinder acts as a container for the fluid, which has two connections: one to the front wheels and one to the rear wheels. Brake fluid is hygroscopic, so it not only absorbs water, but also attracts it. A major part of brake system maintenance is flushing the system. While the absolute maximum amount of time for this procedure is every two years, a better gauge of time would be every six months to a year. This act alone could save vehicle owners much money, because complete brake system repairs and replacements can be a significant cost. Additionally, flushing the transmission fluid every two years or 24,000 miles increases an automatic transmission’s life expectancy. You can find out more information on these and other tips by reading postings on a good vehicle retailer’s website. Unusually abrupt or slow braking can indicate issues with the servo brake or the amount of brake fluid available. 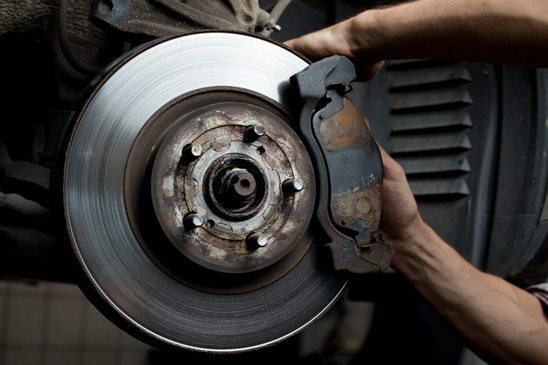 Drivers will hear a slight chirping if the brake pads or discs are worn. If your vehicle leaks fluid all over the road or driveway when it slows down, this often indicates a bad brake pump. Tires are, of course, a contributing factor to the poor or satisfactory functions of a brake system. Checking the wear and alignment of tires can prevent poor brake adjustment or bad brake discs. The weather can have a tremendous effect on the stopping ability and distance of your brakes. Drivers should always practice safe braking and stopping distance in inclement weather. This includes recognizing the state of the road and the weather that may impact driving ability. As a significant power and control tool, tires work in conjunction with the brake system and largely determine how effective your brakes are. Your tire’s ability to adhere to the road in snow or ice is practically zero, and only slightly better in a light rain or on a dusty road. These tips can be checked at home, or professionally at a local garage by a car mechanic. · By using a brake meter or brake tester, you can check the power of each wheel and act accordingly if there is one tire that stands out. · Check the level of your brake fluid often, and replace it every two years. · Any time you are working on your vehicle or checking the brakes, observing the condition of brake pads is essential. The life span is 15,000 miles, but this varies from car to car. · Be sure to check that your brake lights are working. More often than not, replacing the bulb solves this problem. · Mobil Oil provides additional information and tips about proper brake maintenance. The most important aspect of brake checking and maintenance revolves around the tires. This is also probably the easiest thing to check off the list, yet one of the most essential if you want to ensure your own and your passenger’s safety. Regardless of the climate you live in, choosing all weather tires is usually the safest bet. Even if snow does not fall in your area, these tires are effective in very light moisture or on roads that may need a bit of paving. Michelin, for example, makes all weather tires that last up to 20,000 miles longer and are even labeled “green” for their increased fuel efficiency. If you drive a vehicle, then proper care and checking of your brakes are essential to your safety and the safety of other drivers or passengers. By following the tips mentioned above, it is the hope that you will recognize brake issues quicker. This can effectively save money and lives, so start checking your brake system today!